MW Mobile Blog: "I see a burger and beer in your future." That was what Ken said when he heard our plan was to head out to lil' camp for some cutting and clearing after our long walk on the forties. 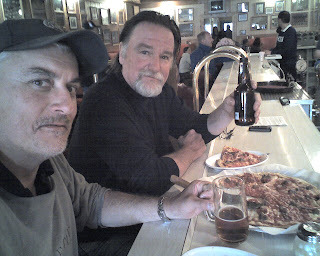 Pizza and beer at The Congress Lounge and Pizza in Ishpeming was our next and last stop before home. I had not been there in decades. We had onion, pepperoni, and cudaghi toppings. It was great.